There are 2 different types of workshop, although both involve making your own Traveler. 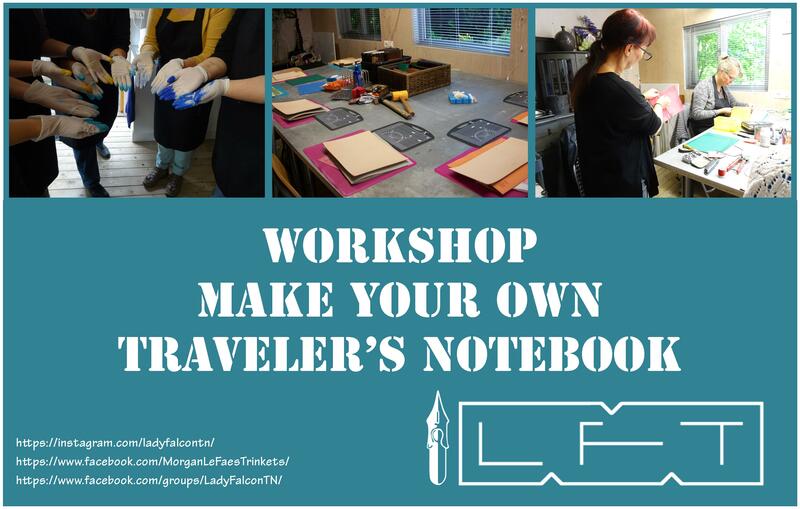 During both Workshop you will make a Traveler’s Notebook in the size of your choosing. We will first dye the leather. After dyeing, the leather has to dry for a bit, before we can process it further. By now it is time for lunch, so we can leave the leather to dry. As soon as the leather is dry enough we will proceed with conditioning the leather, burnishing the edges and adding the elastics for the inserts. After this we will make an insert for your Traveler’s Notebook and a File Folder with pen-loops. Your Travelers Notebook cover is now complete. At the end of the workshop you will have a fully functional Classic style Traveler’s Notebook with 3 inserts. 1 workshop introduction notebook, 1 notebook you made yourselves and a handy file folder to keep loose bits and pieces, with pen-loops. As soon as the leather is dry enough we will proceed with conditioning the leather, burnishing the edges of the pockets and gluing them to the cover. The leather for the notebook covers has been prepared beforehand and we have added the holes for stitching on the outside cover already. However the holes need to be punched through the pockets as well. After this we can start sewing. This will probably take quite a while if you are not used to it. This is why the workshop time might be longer than the estimated 4 hours and why we do not offer notebook sizes over Regular size!!! After sewing we can proceed with sanding and burnishing the edges, and adding the elastics, after which your notebook is finished. We start at 11:00 o clock with coffee and a little introduction. Around 12:30 it’s time for lunch and a little break around 3 o clock. We aim to finish the workshop at 16:00. Total duration of the workshop would be ca. 4 hrs. However the workshop might take longer than stated here, this all depends on your skill level and experience. Don’t worry, we will not let you go home with an unfinished notebook. The workshop will be in Dutch and so is the lesson material. The workshop can be held in English if so requested and English lesson material will be provided. I speak a little German and understand it very well. I can make the lesson material available in German upon request. Price for materials will depend on the size you choose to make. Please send an email to hello@falcontravelers.com to request the pricing for the materials. We will cut the TN to size up front and do any edge prepping and prepping for sewing, this will save time on the day. The inserts you will make will will all be in the size of the TN you select. If you like a specific color, please let me know at least 2 weeks before the Workshop date, so I can arrange that this color is available. You can find an overview of the sizes here and an overview of the colors here. For the workshop only the colors mentioned in the first section (aniline) will be used. Other dates are possible, if you want to plan a workshop for a group of people. Please contact me for further information. Planned workshops will only proceed when there are minimal 3 (studio Lelystad) or 8 (Pulles Shoes Utrecht) participants. Cancellation and refund of the workshop due to this, will be communicated a week before the workshop date. The workshop is either in the Lady Falcon Travelers Studio, Lelystad, the Netherlands, or at Pulles Shoes in Utrecht, the Netherlands. If you come from far, by car or by train, there are several excellent Bed and Breakfast establishments available nearby and a pick-up/drop-off service is available to pick you up. Please contact us for further information.